There'll be no middle ground. If it were up to us, Buick would revive the Grand National nameplate with power and performance to match. Drop the right engine (GM has plenty to choose from) under the new Regal’s hood and it would be ready to go. We already know the next Regal GS will probably be powered by the Camaro’s 3.6-liter V6, and now GM Authority claims it’ll have an output of 310 hp (the Camaro has 335 hp). To compare, the Ford Fusion V6 Sport’s twin-turbo 2.7-liter V6 makes 325 hp, so Buick is falling a bit short here, but we’ll save final judgement until the eventual first drive. We also know the Regal GS will feature, as it does currently, all-wheel-drive. What’s nice about this AWD system is that it’s capable of sending torque where it’s needed most. Also with today’s car, additional body styling elements will be present for an enhanced, sportier look. GM Authority’s sources claim "aggressive" styling with a textured grille and other unique design cues. Will it drive like a proper AWD sport sedan, say an Audi A4 (or even S4?) fighter? That’ll all depend on whether or not GM authorized the engineering team to go all out with the expected driving modes: Sport, Touring and GS. The latter, especially so, must live up to its two-letter name, otherwise, well, you get the idea. 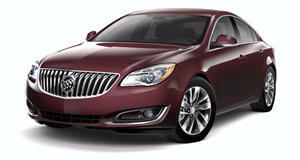 Buick has a huge opportunity to present the upcoming Regal GS as a genuine German AWD sport sedan alternative. Simply arguing that it’ll cost less won’t hack it; it must be the AWD Camaro sedan alternative. The Regal GS was initially expected to debut at Shanghai earlier this year, but that didn’t happen. We’re guessing Detroit this January will be the time and place.